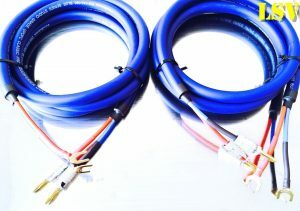 2 x 3m (A Pair) VAN DEN HUL – CLEARWATER Audio Speaker Cables Terminated. • The decision was taken to work with 2 groups of strands with a conductor size of AWG 14; this because in many situations the distance between the amplifier and the loudspeakers is limited. • Therefore a twin-lead construction was made with 2 x 98 strands of a dense very pure silver coated Matched Crystal (MC) OFC. • The two conductor groups are twisted in opposite directions. • The resistance of each lead is: 0.9 Ohm/100 meter. • The capacitance between the two conductors is: 17.5 pF/meter.